Posted on November 1, 2016 at 11:50 pm. 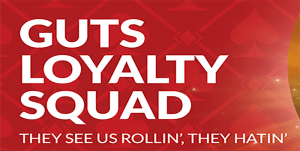 For years Guts.com has been one of our top-rated online casinos for real money pokies, and things just got even more interesting with the launch of the new Guts Loyalty Squad. This is the loyalty program to blow other loyalty programs out of the water, with VIP benefits that aim to appeal to a whole new generation of online players. Entry to the Guts Loyalty Squad is not something you can choose – it’s something that needs to be earned. The only way to join this exclusive group is to be invited by the Guts team, who are constantly scouting their records to find the most loyal players deemed worthy of entry into the inner circle. If you want in on the Guts Loyalty Squad, you’ll need to prove your loyalty to Guts by frequently visiting, depositing and playing for real money. Every time you stop by at the casino, your name will appear on the Guts’ daily, weekly and monthly reports, so becoming a regular will increase your chances of being recognised. An exclusive one-off Loyalty Squad welcome bonus – in addition to the regular Guts welcome package of up to $400 in bonus credits per player. Faster priority payouts for quick access to your casino winnings. A personally assigned VIP Squad Manager who is on call to help you make the most of your Guts experience and assist you in any way possible. Invitations to exclusive VIP events, which can include anything from sporting events and concerts to city escapes and luxury holidays. A special birthday bonus on your big day. Anniversary bonuses to mark every year you spend with Guts. Exclusive Squad offers that include no limit or high limit wagers with lower wagering requirements. Personalised one-off bonuses and promotional offers tailored just for you. Once you’ve gained entry into the Guts Loyalty Squad, you’ll need to continue to prove your loyalty by hitting certain membership requirements to remain in the club. If you successfully make it to the Squad, make sure to check the terms and conditions so you’re aware of your requirements and make sure that the contact details in your Guts account are up to date so you receive all relevant communications. Think you’ve played enough at Guts to deserve Squad status, or are a member of a VIP casino programme elsewhere and want access to this one? You can hit up the Guts loyalty team at [email protected] to present your case, and they can decide whether to let you in. Alternatively, start proving your loyalty by playing pokies for real money at Guts today. Guts offers one of the largest selections of instant-play real money pokies from some of the world’s best software developers, including NetEnt, Microgaming, BetSoft, Quickspin, Play’n Go and more. Gameplay on both desktop and mobile counts towards your loyalty status, and with new pokies added regularly there’s always a new game to try, so head on over to Guts.com and start spinning your way into the Squad. Not familiar with this casino? Sign up for an account at Guts.com to take advantage of a new player welcome bonus that includes up to $400 in matched deposit bonuses plus 100 free spins to use on NetEnt’s popular pokies game, Starburst.